On a cold, rainy Sunday morning late in December, before the first rooster had cocked its doodle do, I found myself wandering through the nearly empty streets of Tongeren, a small, quaint town in Belgium. Founded in 1257, Tongeren is the oldest city in Belgium and has a long, rich history. Sacked and burnt by Louis XIV’s troops in 1677, it was revived in the 1800s. 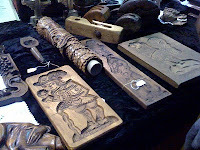 Since then it has become a Mecca for antiques dealers and bargain hunters. Every Sunday, vendors from all over Europe descend on the town to take part in the weekly Flea Market. My mission in Tongeren that morning was not unlike Louis XIV’s mission three hundred years ago. I planned to march over the cobblestone streets, scout the terrain, observe the locals, press forward until I had penetrated the heart of the city, and perhaps gather some booty along the way. Of course, the Sun King left the town in utter ruins and on my mission my fiscal status was the only thing to suffer the threat of ruin. I began on the outer ring of the market, a wide walking path lined with tents and tables operated by antique dealers and independent sellers, pausing to admire a small 18th Century Belgian Prayer chair with a rush seat and turned legs. I imagined the many people who might have used that chair to beg God for absolution or comfort and found myself coveting it. It would be the first in a long list of items I found myself coveting that day. The next item to make it on my “Much Coveted List” was a wooden cookie mold used by Belgian bakers to make Spéculaas, a spicy, crunchy cookie popular throughout the year but especially during Christmas. The molds were heavy and scarred with nicks, dents, and scratch marks, evidence of years of use. I preferred the molds of little Belgian boys and girls over the roosters, baskets of fruit, or malevolent elves. I was tempted to purchase a large mold in the shape of a windmill, but at 125 Euros (about $200 USD) I decided it would have to stay on my coveted list instead of in my suitcase. Click here for a link to a recipe for Spéculaas. I walked by dozens of stalls and deeper into the heart of old Tongeren, stopping to look at a stack of hand-painted Florentine trays, a set of barrister bookcases, a fabulous Louis XV chair, and an old wooden bread bowl once used in a French boulangerie. Each of the items made it onto my “Much Coveted List.” I also explored several “Antiek” shops, marveling at the museum quality furniture and bric-a-brac. 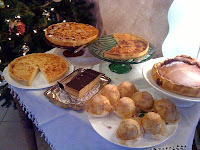 After several hours of exploring, shopping, and coveting, I found I had developed a remarkable appetite. 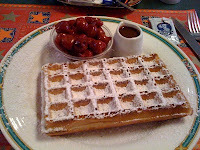 I decided to indulge my craving for something sweet and headed to a small, cheerfully decorated café reputed to make the finest waffles in all of Belgium. I ordered chocolate-cherry waffles and then settled back to sip my black tea, munch on my chocolate dipped cinnamon butter biscuit, and listen to the soothing strains of an opera being played over throughout the café. 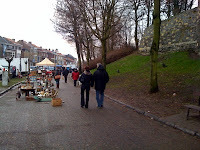 On that dreary, delightful day at the Tongeren Flea Market, I coveted far more than I bought and I discovered the best treasures to be found cost nothing at all: the opportunity to learn about another culture, the warmth of my cashmere gloves, the thrill of the hunt, and the aroma of freshly baked waffles. Glad you smelled the sweet scent of contentment. Flea markets are such an odd assortment of leftovers, essences and enchantments. I could have spent many more hours rummaging through everything with you. That was truly a lot of fun, AND, thanks to you, I scored the greatest transferware deal ever!!! Thank you!!!! !